Pears are plentiful in the fall. And there are so many varieties, from Bartlett to Bosc. 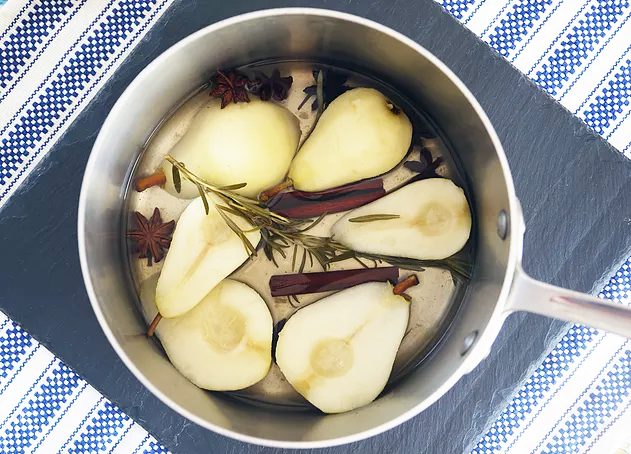 Pears are typically poached in a simple syrup but we wanted to showcase the natural sweetness of the fruit and make a healthier dessert so we use a little water and some fragrant whole spices and herbs in this version. If you have leftovers, you can slice the pears thin and add them to salads. Make ahead tip: You can make this ahead and store in the liquid a day or two before serving. Reheat pears in the liquid on the stove before serving.